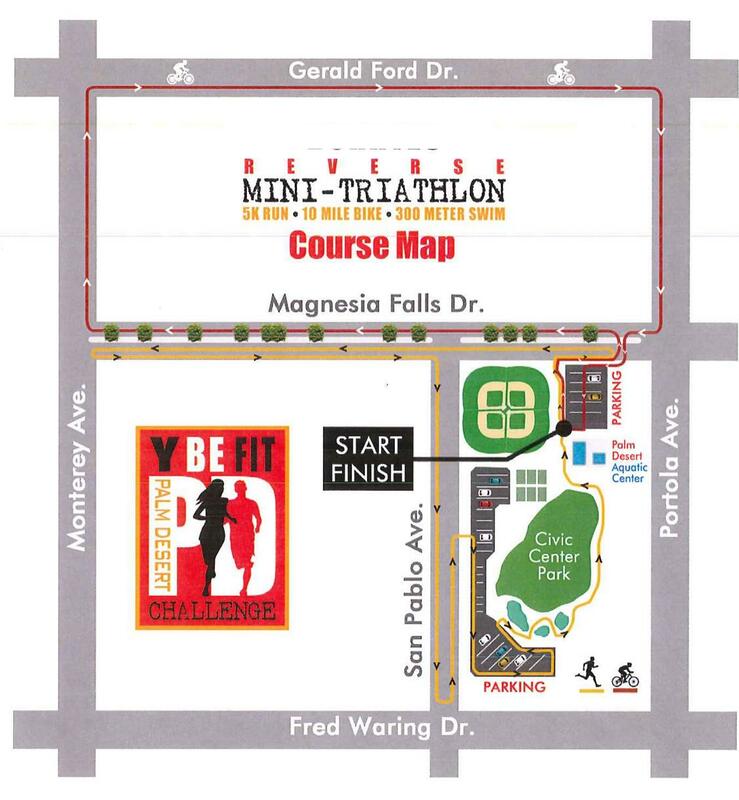 In order to prepare bibs for packet pick-up, online registration is now close. However, you may still register in person at the Family YMCA of the Desert--43-930 San Pablo Ave., Palm Desert, CA 92260--during normal business hours--Monday - Friday from 8 a.m. - 6 p.m.
Y Be Fit Palm Desert Challenge is a health and fitness fair, which will include a reverse mini-triathlon, a 5K run/walk, and a 2K color run. There will be vendors, booths, live music, and pool play. The event is designed to appeal to the broad community. Participants will include serious athletes, non-serious athletes, families, seniors, special needs people, etc. YMCA “Y BE FIT” REVERSE TRIATHLON AND 5K RUN/WALK ACCIDENT WAIVER AND RELEASE OF LIABILITY I acknowledge that the YMCA “Y Be Fit” Reverse Triathlon and 5K Run/Walk (hereinafter referred to as “Event”) is an extreme test of a person’s physical and mental limits and carries with it the potential for death, serious injury and property loss. The risks include, but are not limited to, those caused by terrain, facilities, temperature, weather, condition of athlete, lack of hydration, equipment, vehicular traffic, and actions of other people, including but not limited to participants, volunteers, spectators, and event officials. I hereby assume all risks of participation in this event. I acknowledge that this Athletic Waiver and Release of Liability (AWRL) form will be used by the event director and event sponsors and that it will govern my actions and responsibilities at said Event. I realize that liability may arise from negligence or carelessness on the part of the persons or entities being released from dangerous or defective equipment, property owned, maintained or controlled by them or because of their possible liability without fault. I certify that I am physically fit, have sufficiently trained for participation in the event and have not been advised otherwise by qualified medical personnel. In consideration of my acceptance of this entry to the Event, I hereby take action for myself, my heirs, my executors and administrators, waive any and all rights and claims for damages I may have against City of Palm Desert, City of Rancho Mirage, Family YMCA of the Desert, Palm Desert Aquatic Center, Klein and Clark Sports, LLC, and all agencies whose property and/or personnel are used, and other sponsoring and co-sponsoring company(s), agency(s), or individual(s), their Officers, Officials, Employees, Volunteers, and Agents; and any individuals and volunteers associated with this event, their representatives, successors and assigns, and will hold them harmless for any and all injuries and/or damages suffered in connection with this event. I have been warned that the Event is a potentially dangerous activity and that I must be in good health to participate. I must obey all traffic laws and wear all required safety gear while participating in the Event. In accepting this waiver, I acknowledge I have read and fully understand my own liability and do accept these limitations and restrictions. Children under 18 years of age must have parent or guardian sign the event waiver on their behalf. I hereby consent to receive medical treatment, which may be deemed advisable in the event of injury, accident and/or illness during the event. I understand that at this Event or related activities, I may be photographed. I agree to allow my photo, video or film likeness to be used for any legitimate purpose by the Event holders, sponsors and /or assigns. I also understand that the entry fee is not refundable. The AWRL, shall be construed broadly to provide a release and wavier to the maximum extent permissible under applicable law. As a participating athlete, I certify that all the information provided on my race entry form is true and complete. I have read this AWRL and certify my compliance by my signature below.